First off, congratulations are in order. You or someone you love is newly engaged! Take a moment to bask in this, because it is, in fact, a big deal. No offense to Tolstoy, who began Anna Karenina with the line, “Happy families are all alike,” but we believe every couple (and family) is different, which means every wedding is different. The only real “rule” of wedding etiquette is that anyone invited to pre-wedding events should be invited to the wedding itself. The rest of the details are up to you. The wedding is, of course, the main event, but each of the parties leading up to the Big Day should be carefully considered as well. With that in mind, here is our comprehensive timeline of all your wedding-related events–and when to send the invitations. “Prairial Photo” by Putnam and Putnam. 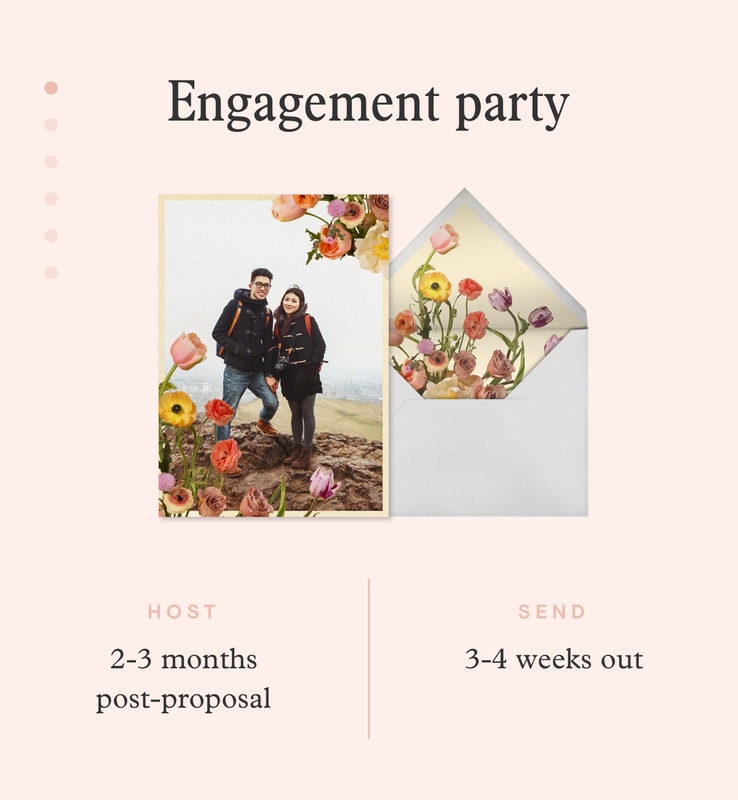 While a traditional engagement party is not necessary for shorter engagements (read: under a year), friends and loved ones will want to toast the happy couple, so why not give them the opportunity? Plus, they are fun and relatively simple to plan. Give the guests of honor a chance to enjoy the moment before the festivities begin, and throw the engagement party a few months after the proposal, before the wedding planning kicks into high gear. Give three to four weeks notice so guests can make sure they are in town and able to join. An exact headcount is key since the venue is probably your home or a local restaurant with limited capacity, so use a classic engagement party invitation with advanced guest list tracking features. Also, surprise engagement parties are trending. Our card RSVP features allow guests to discreetly message you within the invitation to help keep the surprise exactly that. “Centro – Toast” by Venamour. 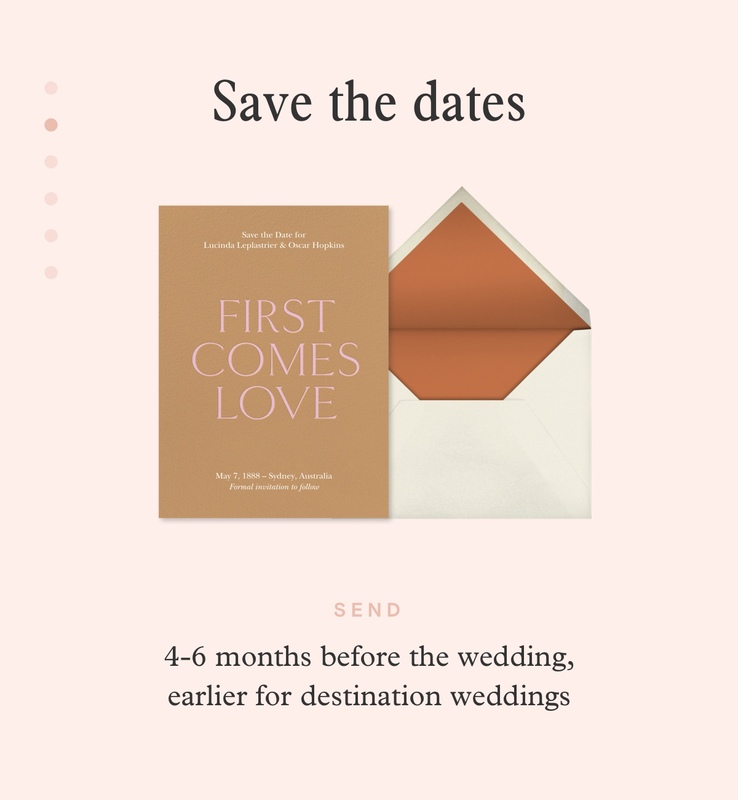 They may be the newest addition to the wedding-planning world (read all about them here), but for destination or holiday weekend weddings, proper save the dates are an absolute must. Four to six months before the wedding is standard, but earlier is best if the wedding will require travel arrangements. As soon as you’ve locked in your date, get your save the dates out the door so guests can start making arrangements. Use a design that hints at your wedding style or keep it modern with an engagement photo. Be sure to include all the high-level information like the date, location, and a heads up on any additional wedding weekend events. 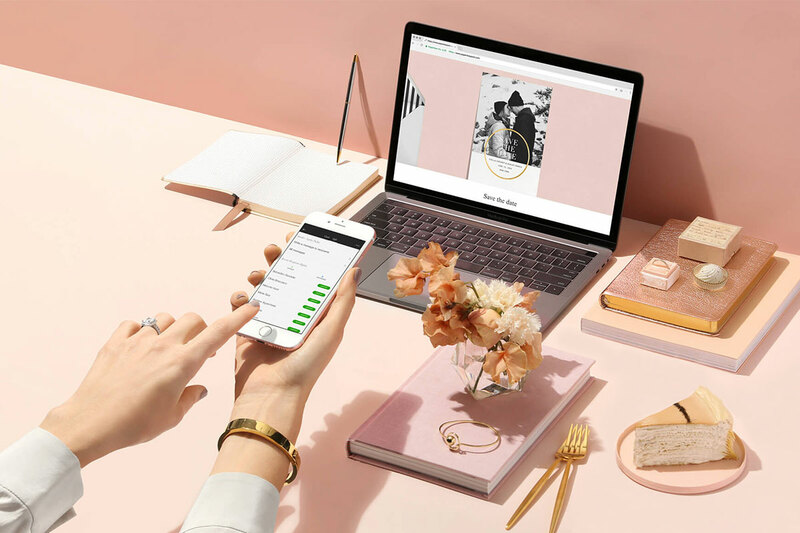 Guests can add your event to their calendars, or you can collect mailing addresses or direct guests to a wedding website from your save the date. And now, the main event. 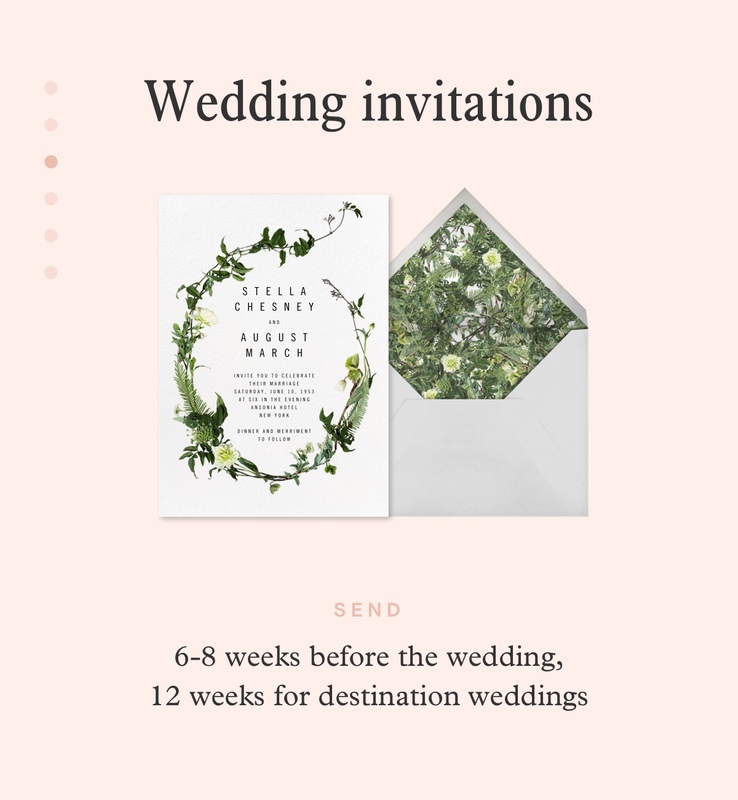 Whether you’re planning a massive multi-day blowout or an intimate backyard gathering, you’ll need a wedding invitation. For small or destination weddings, we suggest one of our online invitations. If paper is more your style, our exclusive printing partner Paper Source can bring our designs to life; browse from our collaboration collections with Oscar de la Renta, kate spade new york, Rifle Paper Co., and more. Mail invitations six to eight weeks before the big day, and twelve weeks before if it’s a destination or you have international guests. From traditional to modern, we’ve decoded wedding invitation wording and the etiquette behind it. Not finding exactly what you’re looking for design-wise? Let our Personal Design Service step in to help design motifs, invitation suites, menus, programs, location maps (your out-of-town guests will thank you), custom language placement, and day-of paper. “March Herbarium” by Rifle Paper Co. The bridal shower is your opportunity to celebrate with close friends and relatives. It’s often during the day (think elegant luncheon) and can include games and traditions like opening gifts from the couple’s registry. We’re all about a simple, classic bridal shower. Timing depends on logistics, but generally a bridal shower is held anywhere from two weeks to two months before the wedding. Corralling a bridal party isn’t always an easy task, so send invitations six to eight weeks prior to the event to give everyone time to sort out any travel details. 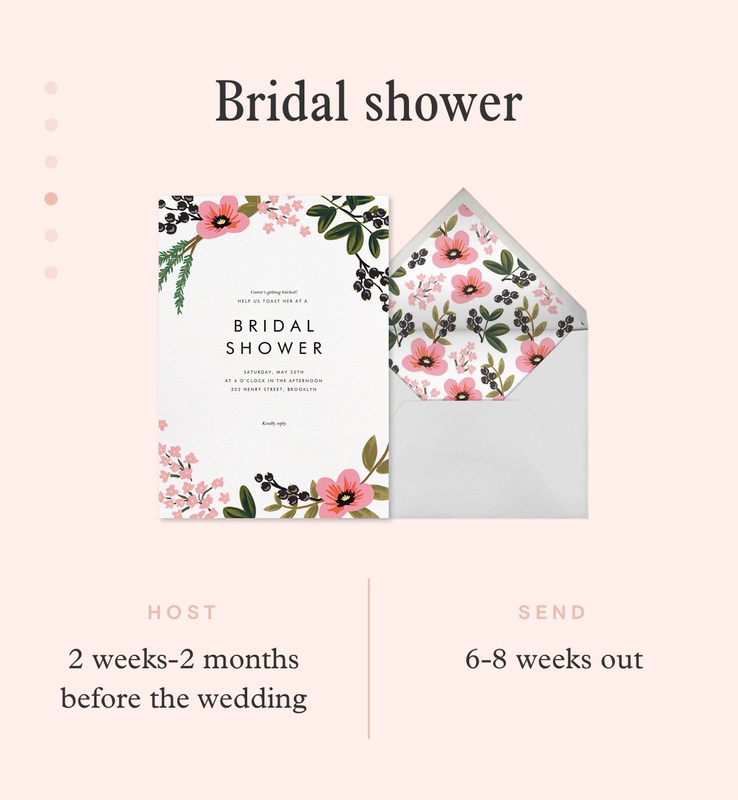 If you’re hosting in a restaurant or any venue that requires an exact headcount, the RSVP tracking on our bridal shower invitations will come in handy. Don’t forget to include registry information since it is still a faux pas to have it on the wedding invitation itself. The difference between an enjoyable bachelorette party and an overwhelming one, we find, is in the planning. A well-organized bachelorette weekend can be an opportunity to celebrate your friend and raucous fun for all involved. The goal of a bachelorette party is to help the bride blow off some steam amidst all the wedding excitement before embarking on the next chapter of her life. With that in mind, hosting too close to the wedding itself will likely add stress to the bride (not to mention everyone else), and the absolute last thing you want to do is be the reason she shows up at her wedding looking like she spent the last three days raging in South Beach. Host the bachelorette about a month before the wedding to give everyone time to recover. Three to four weeks in advance, or at least eight if you’ll be traveling or celebrating for more than one night. From a relaxing spa day to a boozy night on the town, we have a flyer for every kind of bachelorette. The additional info block option makes it easy to add dress code details or, ahem, could be the best way for everyone to pay you back for putting all the reservations on your credit card. “Love Letter (Stationery)” by Paper + Cup. Our wedding timeline wouldn’t be complete without mention of thank you notes. Show your guests your gratitude for taking the time, effort, and expense to take part in making your Big Day great. Try to thank anyone who gave you a day-of wedding gift within two weeks. For gifts received after the wedding, there’s traditionally a three-month window for thank you notes. If you are the bride, it’s polite to thank your engagement party host, your bridal shower and bachelorette hosts as well as anyone who attended, your bridesmaids, groomsmen, officiants, and of course, your parents. Even the smallest bit of personalization is always appreciated, so be sure to take a moment to reflect on how exactly each person contributed. Bachelorettes, showers, save the dates, oh my. Find every invitation for every kind of wedding party’s party.